6am - 10am (Monday – Thursday) Mike’s mission is to get your day started filled with music that will get you moving and keep you going. Music from Third Force, Bob Baldwin, The Crusader’s, Marcus Miller, and others. 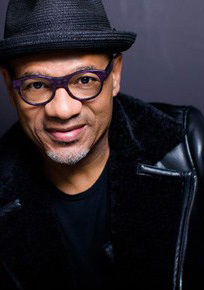 10am - 2pm (Monday – Thursday) Jazz by design was created with you in mind. You get a mixture of smooth, contemporary, fusion, funk, and hint of R&B vocals for your mid-day. Most the music you hear on jazz by design is the latest release from various jazz musicians and vocalists with new artist debut at noon. 2pm - 6pm (Monday – Tuesday) 2pm - 5pm (Wednesday – Thursday) The Jazz Club is hosted by National Recording Artist…saxophonist Kyle Turner who brings an extensive knowledge of jazz for your afternoons…from straight ahead, to contemporary and smooth. 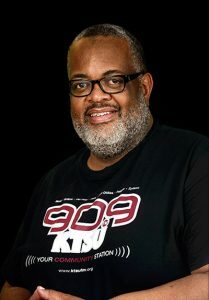 The Jazz Club will feature interviews from some of Kyles notable musical friends such as Robert Glasper, Darryl Lavigne, Kim Waters, Althea Renee, Najee and others. Spend your weekday afternoons with Kyle Turner in the Jazz it’s a musical experience every day! 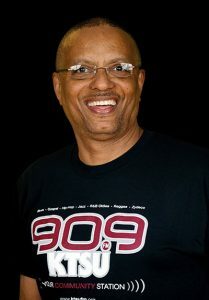 12pm -1pm (Wednesday) Rick is a veteran music journalist, radio host and educator. His one-hour show focuses on celebrating “the musicians who are keeping this great music alive and passing it forward into the 21st Century.” Jazz in the New Millennium is a modern mainstream jazz program that also explores jazz artists' forays into other musical genres, from traditional swing and bebop to funk, fusion and hip-hop, as a part of their career journeys. 6pm – 10pm (Monday – Thursday) Chef Tim brings you 360 degrees of the great sounds of jazz from Big Band, to Be-Bop, Classic, Jazz Fusion, Acid Jazz and more. Tuesday’s from 7-8pm is the Tuesday Tribute where I'll feature a musician, instrument, theme, etc. for your listening pleasure. 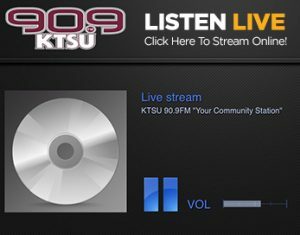 Its music bites every night at KTSU, Bonapetite! 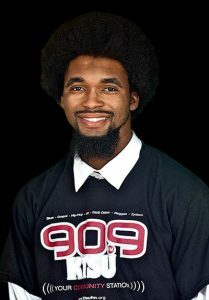 10pm – 2am (Wednesday) Join Hue for a blend of jazz and neo soul…late night on Wednesday from 10pm – 2am. Hue brings a flavor with blends both genere’s to give you just the right mixture of these to musical formats. Try the Blend…Wednesday’s with Hue! 2am – 5am (Tuesday – Thursday) Represents America's Original Art Form in its uniqueness. Listeners are exposed to young artists such as Robert Glasper, mid aged vocal artists such as Carmen Lundy and deceased artists/composers like Duke Ellington. 10pm – 2am (Tuesday) A show filled with music of black American origin characterized by improvisation, syncopation, and usually a regular or forceful rhythm, emerging at the beginning of the 20th century. Blended with the soul mixture of rhythm and blues to sooth and smoothly complete the evening moving into the next day. 2am – 6am (Friday) Wayne’s theory for playing classic R&B music is that the song must have been a number 1 'Hit'. Songs which are generally known and popular with most people. I believe this strategy causes listeners to remissness on where they were and what they were doing at that time. 10am – 2pm (Friday) A mixture of R&B classics as well as the café sounds from back in the day. Classic Café also includes the “Bunch for Lunch”, spotlighting your favorite R&B artist. 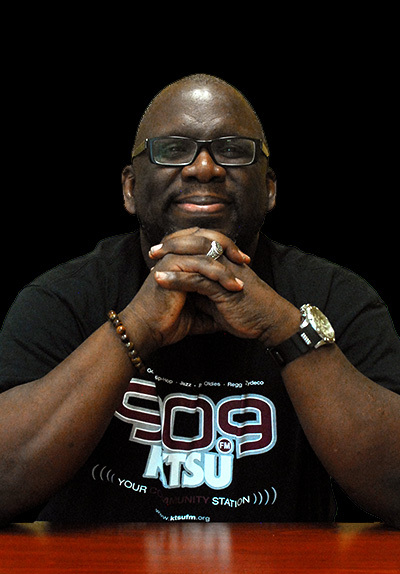 2pm – 5pm (Friday) It’s the music that takes you to that place of yesterday, which will make you reminisce about the “House Parties” listening to Teddy P singing “Turn off the Lights”, right at the time mama walked in the room with those meatballs. You knew not to touch that blue light! 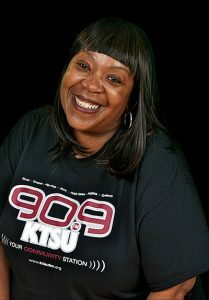 6pm – 10pm (Friday) The Friday Express is the continuation of the rich musical heritage that has made KTSU’s Friday programming an American original. Devan has amalgamated all that he has learned to design an historic, sometimes emotional, and always entertaining journey through R&B music each and every Friday. 10pm – 2am (Friday) The Juice Krew is comprised with Texas Southern University undergrad and grad students who have taken old school hip hop to another level. Their innovative ideas of approaching radio is unique and different…check’em out…THE JUICE KREW...every Friday night at 10pm…you will be hooked! 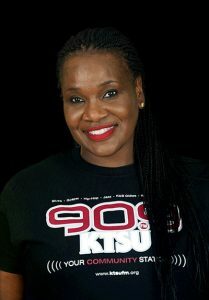 10am – 2pm (Saturday) The Midday Groove provides a mix of all the hits from the 80's, 90's, and 2000's. From Frankie Beverly and Maze to Doug E. Fresh. Noontime features the "Choice Mix at Noon" featuring Chilly Bill Smith in the mix. 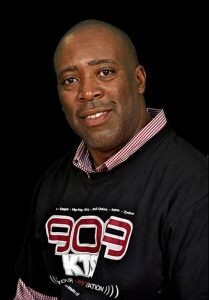 2pm – 6pm (Saturday) Paul Davis aka PD continues your Old School jams with the DAY PARTY. 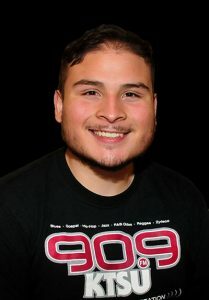 He brings a flavor that will take your afternoons to a different level musically with request and live on air feeds. 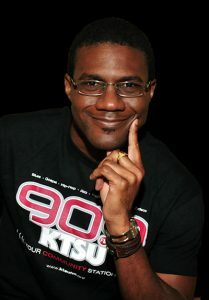 You want a party…PD will bring you the party every Saturday afternoon from 2 – 6 pm…it’s the DAY PARTY LIVE! 2am – 6am (Sunday) Late Night Groove provides R&B and Soul music from about the mid 50s to the mid 70s. I like to give the people not only the big hits from the marquee artist, but the not so big hits from the smaller artist that maybe they have not heard in years, or in this case, decades. 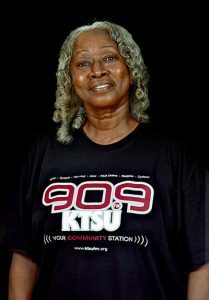 5am – 6am (Tuesday – Friday) This is a traditional gospel music program that has been on for more than twenty years. Traditional does not mean old. It simply means that most music played is not contemporary but recordings from music greats such as the Jackson Southernaires, Inez Andrews, Mighty Clouds of Joy, and Lee Williams and Spiritual QC's. 6am – 10am (Sunday) Ricky provides a spiritual guidance by the music he plays. He gets the listeners ready for church. Ricky Williams is always excited with his uplifting spirit. 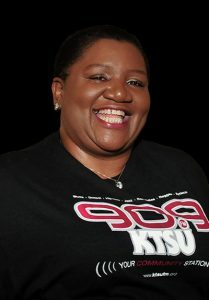 10am – 2pm (Sunday) As the host of Songs of Praise, my purpose is to provide good quality Gospel music to the listeners and supporters of KTSU. Traditional as well as contemporary songs. 2pm – 4pm (Sunday) Afternoon Inspirations is a mix of inspiring and uplifting Gospel Music, interviews and information to get the listener through their Sunday afternoon. Whether coming from their morning worship service, going to an afternoon service, eating with family and friends or just enjoying a relaxing drive, Afternoon Inspirations lets the listener reflect on the previous week and prepares them for the week ahead, appreciating God through the inspiration of His Word in song. 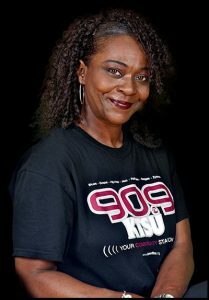 9pm – 10pm (Sunday) Angela spotlights a new or local artist every Sunday night. Find out who the next new Gospel artist will be with Center Stage. 10pm – 2am (Monday) This is a program designed to keep the praise and worship going as people start a new week. It includes traditional and contemporary gospel music that the audience knows and loves, but it also includes music that the audience may not usually be exposed to. 10pm – 2am (Thursday) Is a weekly radio program that truly encompasses the musical energy of the Caribbean Island. Every Thursday Night you can expect to hear All facets of Reggae and Calypso Music along with authentic accents of the show's hosts. 5pm - 7pm (Friday) "Southern Soul" is today's extension of classic rhythm and blues with a touch of dance music that celebrates pleasure, success, also to include the story-telling tradition. Blues is a form of music that express hardship by way of story-telling in songs about life and relationships. 6pm – 10pm (Saturday) Zydeco is the dance music of Louisiana's rural Creoles. Sometimes called "la-la music," also Creole French expression for poverty, which turned up in the deep south of Louisiana. Like the blues, early zydeco offered a way for the rural poor both to express and to escape the hardships of life through music and dance. 6pm - 7pm (Sunday) A weekly news and public affairs show that engages guests in stimulating conversations around local, national, and international subjects and current events in the areas of health, education, politics, and the like. 8:30am – 10am (Saturday) Open and engaging dialogue with the community, information and high profile guest are the staples that have fueled the show’s success. 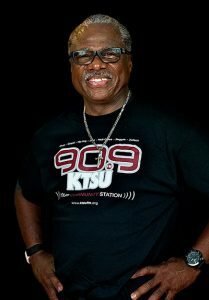 With the addition of legendary talk show host, Ralph Cooper, KTSU Sports Talk is the destination for a unique brand of sports conversation.